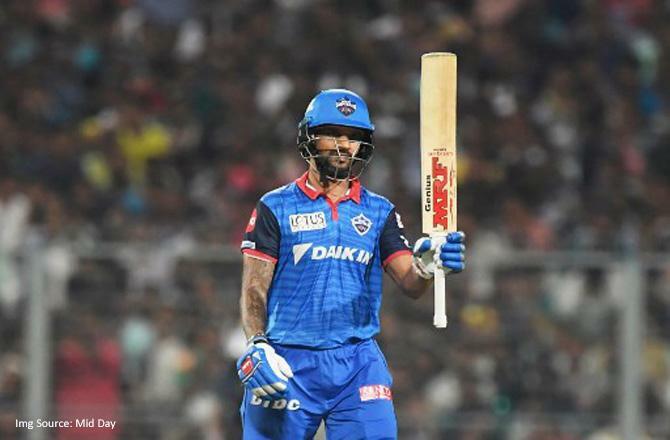 Shikhar Dhawan found form with a 63-ball 97 and powered Delhi Capitals to a seven-wicket win over Kolkata Knight Riders in the IPL Friday, leaving two legends at the visiting dugout beaming. Chasing 179, Colin Ingram launched one down the ground to finish the game in style and deny Dhawan what would have been his maiden hundred in this format. Coach Ricky Ponting was the first to stand up and applaud the big six from Ingram, and advisor Sourav Ganguly had a smile on his face. Two days ahead of the Indian team selection for the World Cup, Dhawan, who survived a review on 11, decorated his knock with 11 boundaries and two sixes, as Delhi registered only their second IPL win at the Eden Gardens. Delhi climbed to fourth spot with eight points from seven matches, while this was KKR's second straight defeat after losing to Chennai Super Kings in their last match. They now have eight points from seven games. Rishabh Pant (46 off 31 balls) played a perfect second fiddle to Dhawan, curbing his rash shots and showed immense maturity in a 105-run partnership from 69 balls, which virtually killed the contest. Pant, however, fell short of his half-century as he failed to clear the rope against Nitish Rana. Going through a lean patch since his sedate 47-ball 51 against Chennai Super Kings on March 26, Dhawan was seen going through an extensive drill under Ganguly, who gave him useful tips. Prithvi Shaw (14) gave Delhi an explosive start, hammering two sixes off New Zealand pacer Lockie Ferguson, but he could not make it big while skipper Shreyas Iyer departed inside the powerplay. There was a mountain to climb with 122 required from 14.2 overs when Pant joined Dhawan in the middle. But the duo got the job done with consummate ease. Earlier, Andre Russell blazed away to a 21-ball 45 after Shubman Gill's brisk half-century, powering Kolkata Knight Riders to a challenging total. This was Russell's sixth successive 40-plus score, his four sixes and three boundaries coming after youngster Gill stroked 65 off 39 balls, helping the hosts recover from Ishant Sharma's wicket-maiden first over. The Jamaican, who was cleaned up by Kagiso Rabada with a toe-crushing yorker in their Super Over defeat in the first leg, also exacted a sweet revenge smashing the South African for two sixes in an over that yielded 16 runs. Chris Morris removed Russell in the penultimate over when he was caught in the deep by Rabada. Sent into bat, from batting at No. 6 in their last match against Chennai Super Kings, Gill was promoted to open the innings and the 19-year-old responded with a fine knock, his second IPL fifty, and first this season. Gill smashed seven fours and two sixes, both against spinner Axar Patel, and along with Robin Uthappa (28), added 63 runs after a horror start. Ishant knocked out the off-stump of Joe Denly with a fantastic inswinger, the Englishman lasting just one ball on his IPL debut. Delhi could not have asked for a better start with Ishant starting the proceedings with a wicket-maiden. But KKR did well to bring themselves out of the rut with Uthappa and Gill counter-attacking with a flurry of boundaries.